Hay Bro Sis...A battered and old motorcycles do not always end up being unused junk. But now, many lovers of motor-nan battered old motor to be used as a collection of antiques. Examples such as Harley Davidson. 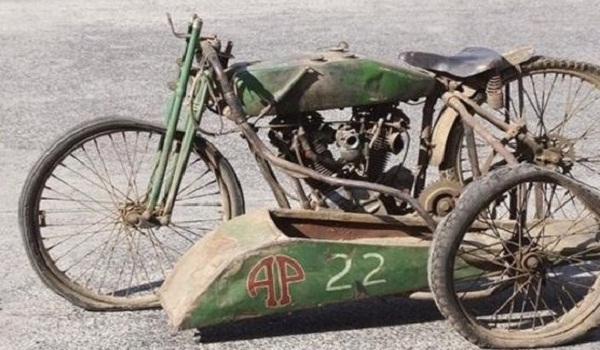 The first is a battered motorcycle as a record breaker with an auction value of the most expensive in Australia. Harley Davidson sold at a price of 600 thousand Australian dollars or equivalent to Rp 6.14 billion. Motorcycle outdated that has been stored for 50 years has very battered condition and not well maintained. As the quote of the Drive, on Wednesday (30/09/2015), which said that the motorcycle was named Class C produced in 1927's. The Class C is formed with the technical specifications of the FHA V-twin engine with eight valves. Class C is also produced by the manufacturer Harley Davidson sekitan 50 units worldwide in the period from the 1920s. Formerly, Class C was designed and built specifically as a racing motorcycle with sidecar. The motor is built specifically to race on the track oval tracks. For fuel, this battered old motor nan using a combination of wood alcohol as much as 75 percent and as much as 25 percent benzene. According to a description taken from the guidebook, fuel use has a goal to produce a very good speed and outstanding on a wooden board or land tracks. For the price, it is designed to avoid price competition in motor racing from other factories. Auctions were held on last week invited a lot of offers from all over the world will be older Harley Davidson motorcycle Class C. But the final price has reached the highest price of 600 thousand dollars was won by Australia who knows whom, because the auction house Shannon reluctant to reveal who had bought the bike mototr Class C.